This works great on the wall or your front door, or on a table. I made it in about a day and a half. 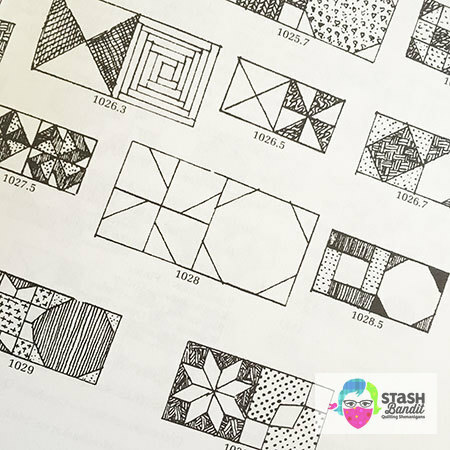 I was browsing Barbara Brackman’s Encyclopedia of quilt blocks and I noticed #1028, Lightning, from the Gutcheon Quilt Design Workbook. The left half of it looked like a four-leaf clover to me. Later that day I made a little test block, and Lucky was born. It’s one of those blocks that’s so easy and charming, before you know it you have a nice little stack of them. 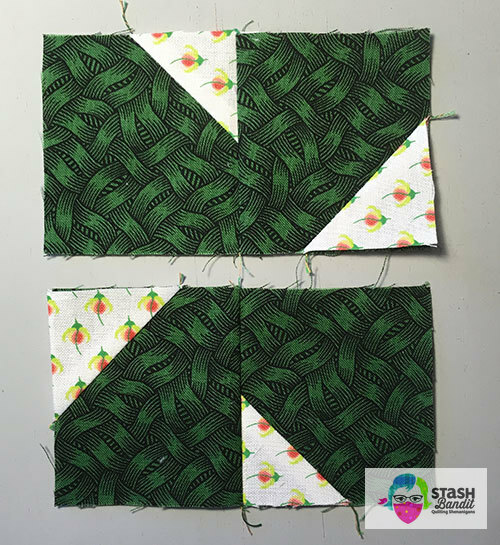 I made just nine blocks at first but decided that maybe I’d like a rectangular quilt more, so I made extras and liked that effect. Either one works! It’s just a matter of what you decide to do. 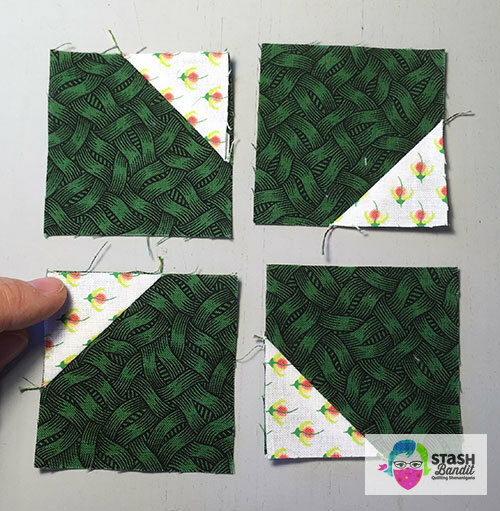 Here’s how to make the little four-leaf clover block. 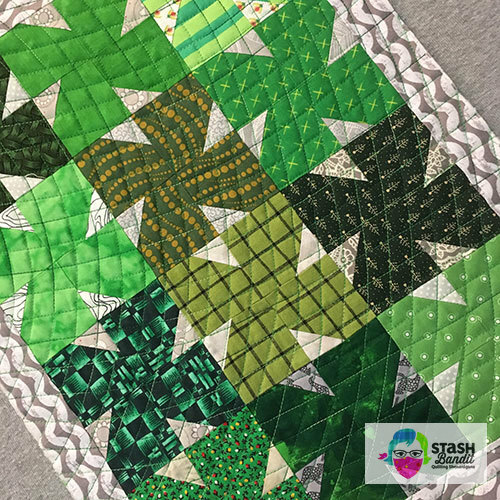 Each block takes four matching green patches cut 2.5″ x 2.5″ and four matching light neutral background patches cut 1.5″ x 1.5″. Make sure there is plenty of contrast between the green and the background; in other words, you must be able to clearly see the difference between them when you put them on a vertical surface (like a design wall) and stand back across the room. The greens should be noticeably darker than the backgrounds in this case. 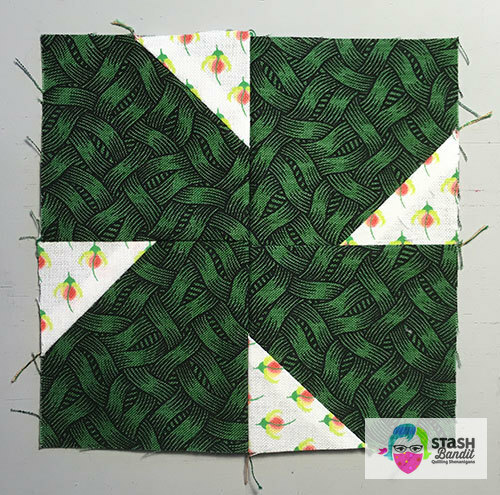 You’ll stitch and flip each light patch onto a green patch by sewing diagonally across the light patch. You can mark the diagonal line on the wrong side of the light patch or you can eyeball it. I try to sew a hair closer to the corner rather than directly on the diagonal. Trim just the white patches as shown above to leave a 1/4″ seam allowance. Leave the green patch underneath untrimmed. Trim all four of the units. Open out the white patches and press. Now you’ll rotate the patches into the correct positions. Look at the photo below and arrange the patches as shown. 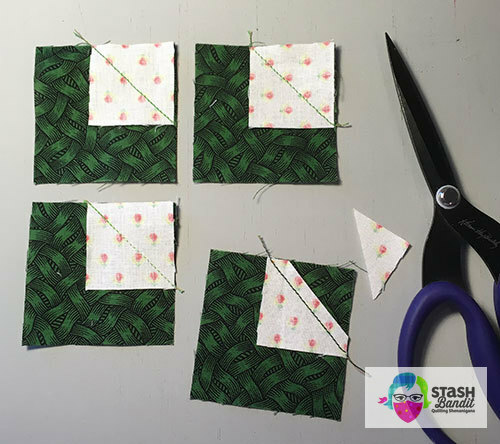 Sew the top units together and the bottom units together. Press the top seam toward the right and the bottom seam toward the left. 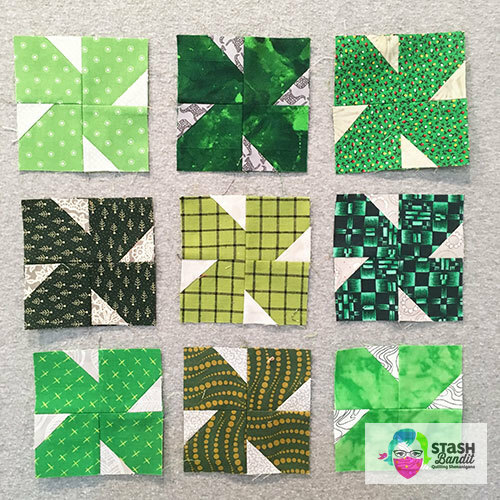 Finally, sew these units together to complete the little shamrock. The seams will nest nicely together. Press the final seam open to distribute the bulk. 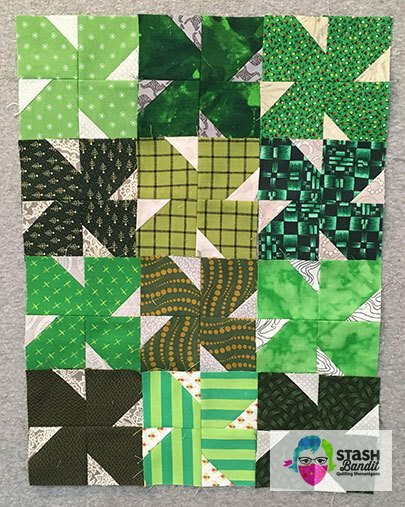 Pick out a variety of greens and make as many blocks as you like. 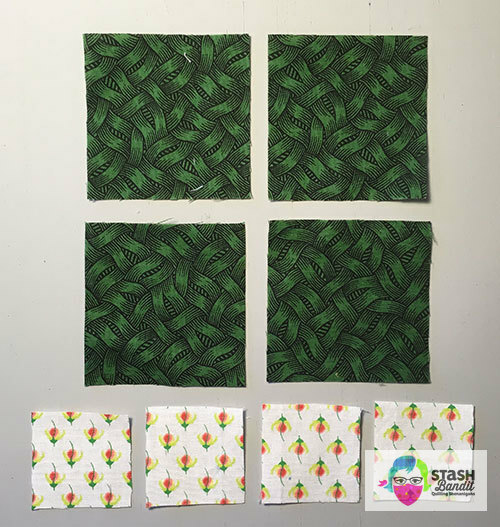 Be sure to have variety in your fabrics! Some greens should be darker and some lighter. Some should be yellowish and some should be like grass. Some can be grayish and some can be almost neon. 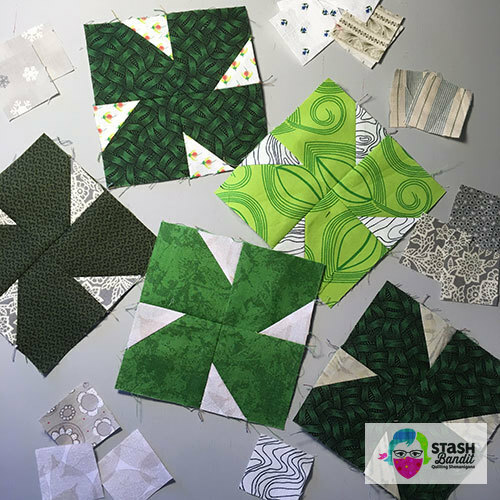 Variety is what makes a scrap quilt work, even at this small scale. Sameness is boring so be brave and make bold choices. 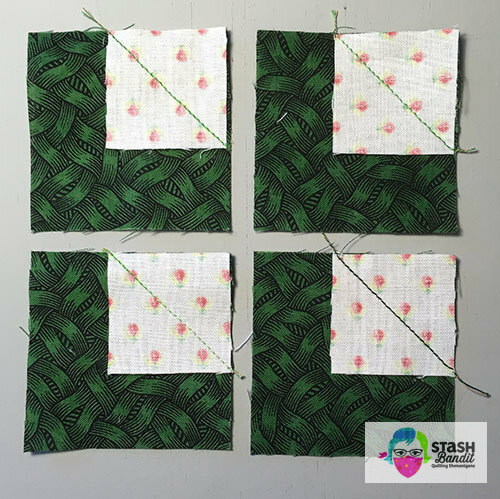 Sew the blocks together in rows. Sew the rows together. Cut enough border strips to go around the quilt. Mine were cut 1.5″ wide. Sew the side borders to the quilt, followed by the top and bottom borders. 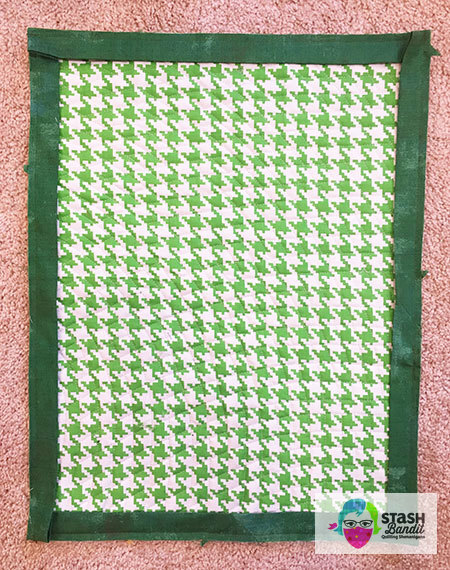 Pick out something really cute from your stash like this green and white houndstooth. 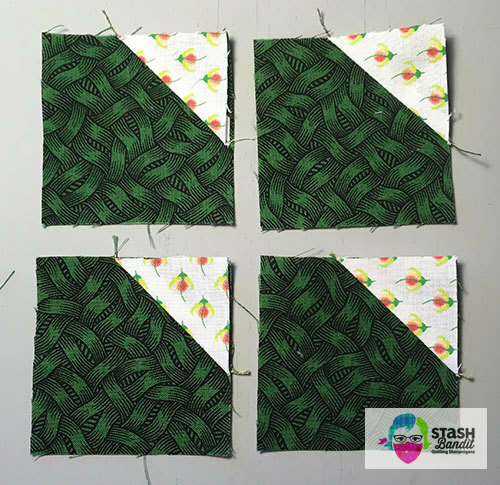 Layer the backing, batting and quilt top and baste them together. 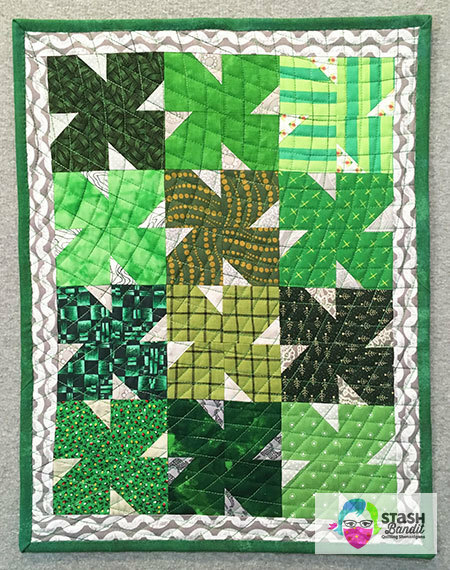 I quilted this with a walking foot on my HQ Stitch 510 by Handi Quilter, which is fast as lightning! On a piece this size, I like to ignore the piecing and quilt one smoothly curving line across the quilt. Then I echo that line across the entire thing, putting the lines about 3/4″ apart. Once all those lines are done, I quilt another smoothly curving line in a different direction. I repeat the process by echoing that line all the way across the quilt. This creates interesting shapes in a cross-hatch and I love the effect. Super easy and really fast, but it looks great. I bound the quilt using my Quilt Binding by Machine technique. Fast, easy and durable! I love that backing. I’m not Irish but I still love this little quilt! 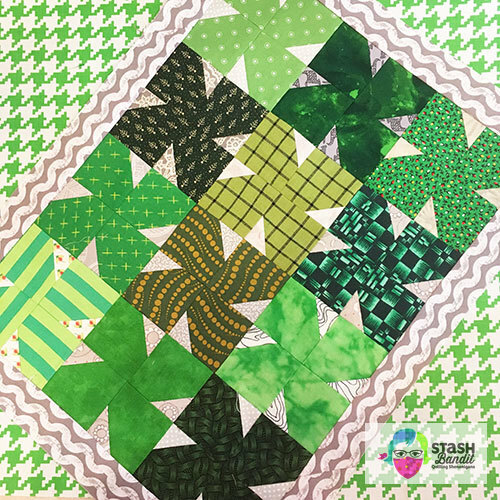 If you make a block or a quilt, send me photos and I’ll post them on my social media. Use diane@stashbandit.net. Thanks for visiting Stash Bandit. My specialty is combining many fabrics in interesting ways to make dynamite scrappy quilts. 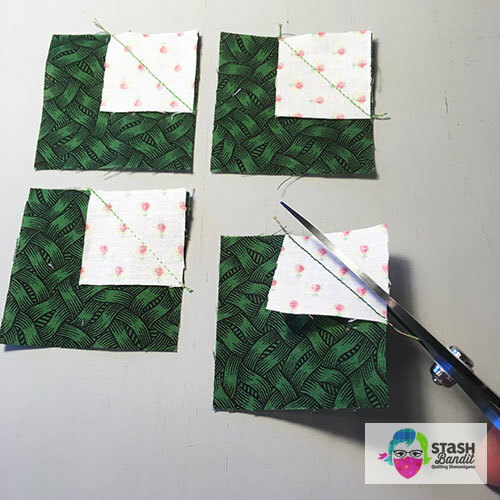 After 11 years in the quilt industry, I started a business called Stash Bandit. 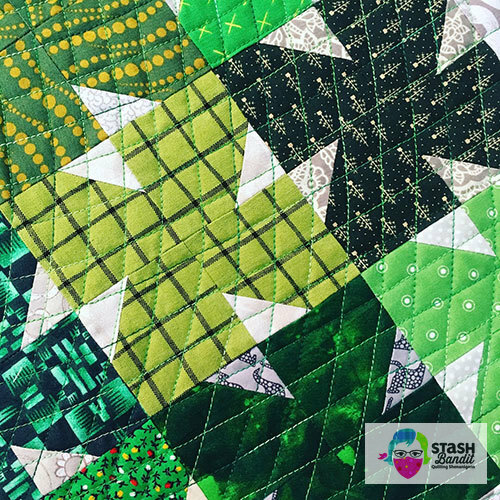 I speak to quilt groups regularly and I’d love to come to your town! Give me a call and Let’s Talk Quilts! Read more about my trunk shows. I think if I do this, I’ll finish it up like your photo “shamrock22” – the one that has the gray border on, and it’s just laid down catawampus on the green hounds tooth. I know! I just threw it down on the backing houndstooth but doesn’t it look great?! Wish I’d thought to do it that way. Can’t wait to see yours! So cute—looks like fun. Thank you! Thanks for the pattern! Our son-in-law is Irish descent & I’ve always wanted a shamrock pattern! You’re welcome, Kathy. My pleasure!